2 Treat yourself to a night of jazz with internationally acclaimed trombonist, composer and producer Delfeayo Marsalis and his Uptown Jazz Orchestra. Presented by Civic Music Association. 7:30 p.m., Hoyt Sherman Place. $35-$60; hoytsherman.org. 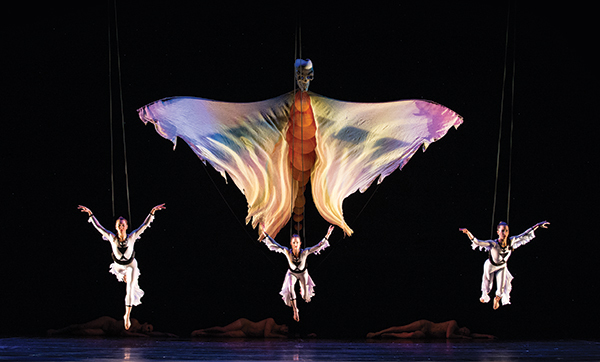 3 Known for its illusionistic, inventive style and stunning beauty, the dance company Momix (pictured) will bring the landscape of the American Southwest to life in “Opus Cactus.” Presented by Des Moines Performing Arts. 7:30 p.m., Des Moines Civic Center. $15-$60; dmpa.org. 9 Packed with showstopping song and dance numbers along with plenty of razzle-dazzle, “Chicago” is a clever story of “celebrity criminals,” the Jazz Age and show business. “Chicago” now ranks as the longest-running American musical in Broadway history. Presented by Des Moines Performing Arts. 7:30 p.m., Des Moines Civic Center. Through March 11 (times vary). Tickets start at $35; dmpa.org. 24 Following pianist Christopher O’Riley’s performance of Beethoven’s First Piano Concerto, the Des Moines Symphony will perform “Beethoven 7—Apotheosis of the Dance.” 7:30 p.m.; also, March 25 at 2:30 p.m., Des Moines Civic Center. $15-$65; dmsymphony.org. 31 Hundreds of local student dancers join Ballet Des Moines’ professional and pre-professional talent to bring the beloved fairy tale “Cinderella” to the stage. 1 and 6:30 p.m., Des Moines Civic Center. $16.50-$55.50; balletdesmoines.org. 3 The 2016 Tony Award winner for best play, “The Humans” chronicles the Blake family over the course of a Thanksgiving dinner in their ramshackle Manhattan duplex, where their fears and follies are exposed. Presented by Des Moines Performing Arts. 7:30 p.m., Des Moines Civic Center. Through April 8 (times vary). Tickets start at $35; dmpa.org. 6 Set in the early 20th century in New York, the musical “Ragtime” tells the story of three families in pursuit of the American Dream. 7:30 p.m., Des Moines Community Playhouse. Through April 29 (times vary). $29-$46; dmplayhouse.com. Kum & Go Theater at the Des Moines Social Club. Through April 22 (times vary). $20-$35; iowastage.org. 17 The melodrama! The operatic score! The epic tragedies! It’s “Les Miserables” and you can’t help but love it all, no matter how many times you’ve seen it. Presented by Des Moines Performing Arts. 7:30 p.m., Des Moines Civic Center. Through April 22 (times vary). Tickets start at $35; dmpa.org. 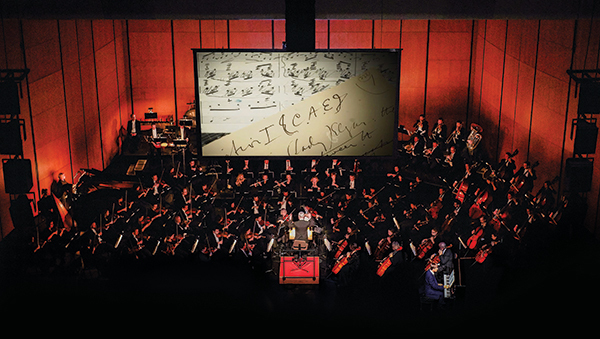 28 Experience English composer Edward Elgar’s “Enigma Variations” during a multimedia show brought to life by actors and the Des Moines Symphony. The production is this season’s “Beyond the Score” concert (pictured). 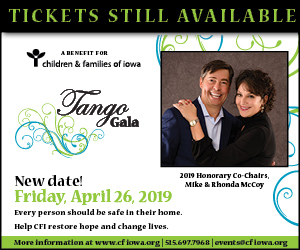 7:30 p.m., Des Moines Civic Center; also, April 29 at 2:30 p.m. $15-$65; dmsymphony.org. 24 What awaits you in the May/June issue of dsm? Find out at the unveiling party hosted by Grand View University. Enjoy socializing, networking, and sampling cocktails and hors d’oeuvres. 5-7 p.m. (unveiling and short program at 6 p.m.), 1200 Grandview Ave. Free; dsmmagazine.com; grandview.edu.